EAA Chapter 179 – Come Fly With Us! We are the Albuquerque chapter of the Experimental Aircraft Association (EAA), headquartered in Oshkosh, WI. We are recreational pilots, aircraft builders, and aviation enthusiasts who love to share our passion for aviation with the general public, promote aviation safety and education, and serve the local aviation community. Whether you fly, build, restore or simply enjoy airplanes and aviation, you are welcome to attend our events and join our chapter. Come to our next meeting or event! I’m interested in EAA Chapter 179, how do I join? Meet monthly, on the 3rd Tuesday at Copper Canyon Café, 5455 Gibson Blvd SE, Albuquerque. 5:00 no-host social time over dinner, 6:00 chapter meeting with an aviation presentation to follow. December meeting at an alternate location – contact us. 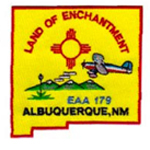 Host the annual Land of Enchantment Fly In in late August/early September at Albuquerque’s Double Eagle II Airport (KAEG), previously held at Moriarty. Our volunteer pilots introduce young people 8 – 17 years old to aviation with a free Young Eagles flight. Promote instrument flying, proficiency, and safety through monthly IMC Club meetings. Grant aviation scholarships annually to applicants under age 25 pursuing an aviation education (flight training, A&P certification, etc.). Presented at March chapter meeting. Grant tuition scholarships for EAA’s Air Academy in Oshkosh, WI. Conduct the annual Double Eagle Aviation Academy, offering teens an opportunity to explore a future in aviation through a week long program at the airport. Host EAA’s “Flying Start” program, providing an informational session for adults who are serious about learning to fly. EAA pilots volunteer as mentors to help participants get started towards their goals, providing an introductory “Eagle Flight”. Sponsor the NM Tech Aero team in their competition to scratch build and fly a model electric airplane. Participate in local outreach activities which promote general aviation.